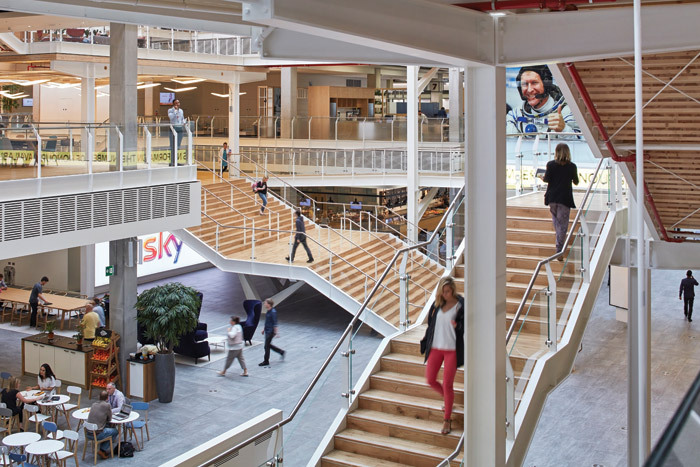 A team of architects, designers and engineers have created an HQ for the satellite TV giant and delivered future-focused flexibility. 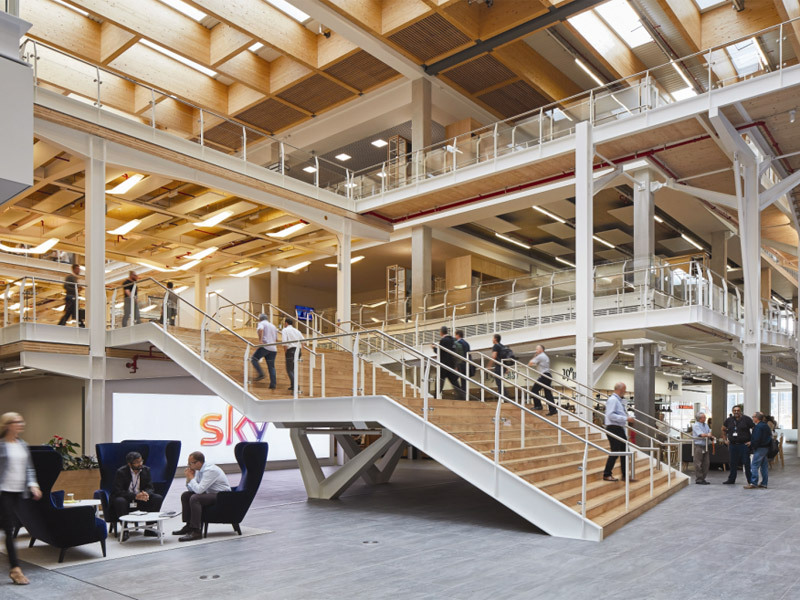 Last year saw the opening of Sky’s impressive UK HQ, Sky Central, as delivered by a design team made up of some of the top international names in architecture, design and engineering. 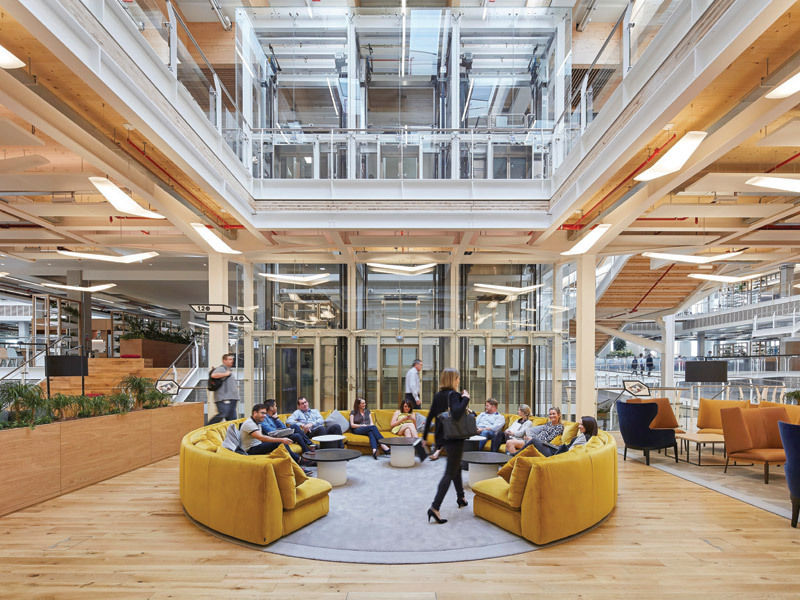 In charge of the workplace design was architecture practice HASSELL, which has delivered a flexible design scheme that it describes as ‘future-focused’. Across more than 37,000 sq m of office space, the plan was to unite more than 3,500 Sky staff on three levels. 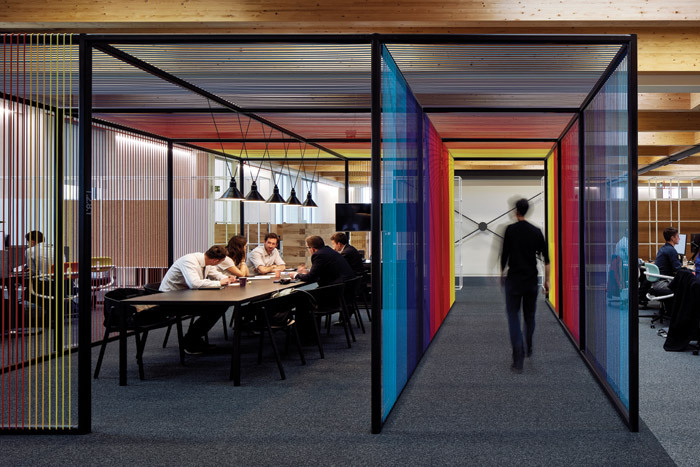 The project design team was briefed to create a workplace and building that ‘would be responsive, inspiring, intuitive and amenity rich… catering to the energetic, fast-paced Sky way of working’. 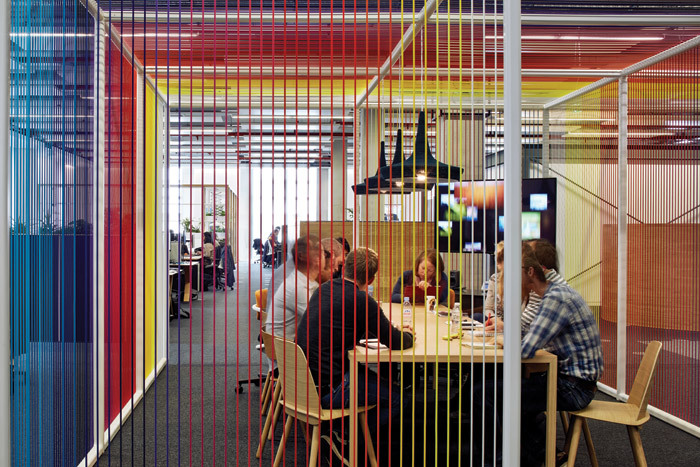 The client wanted to encourage the flow of people and ideas around the business, while also seeing the business in action, as soon as you walk in. 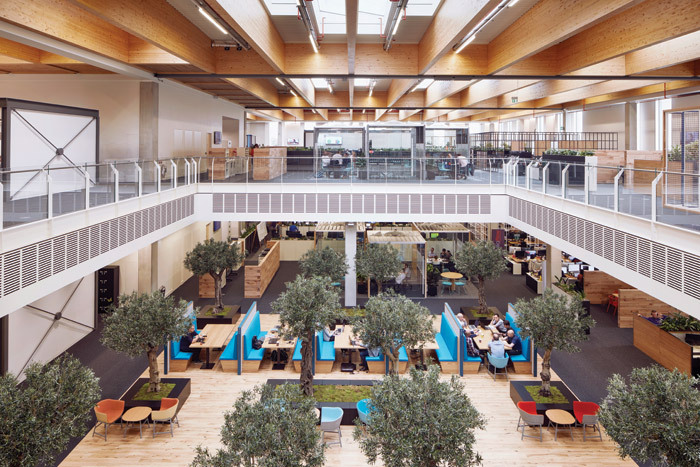 For its response to the brief, HASSELL has delivered one of the UK’s largest activity-based workplaces within the new HQ, where each floor measures on average 11,500 sq m. The interior scheme has been strategically fitted out as a demountable kit of parts, offering full mobility for staff and organisation. 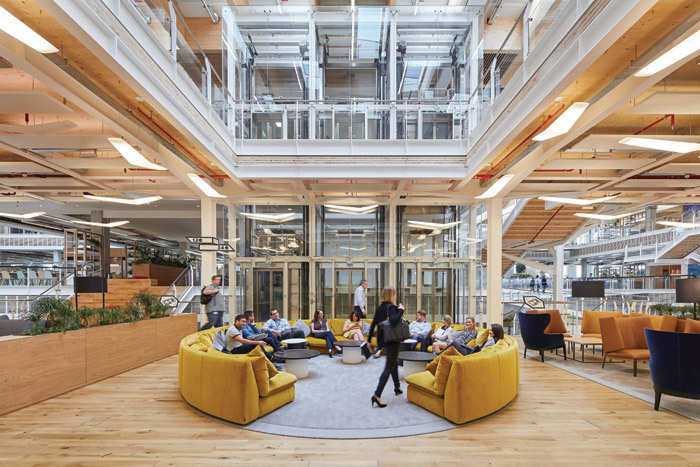 HASSELL principal Felicity Roocke says the vast scale of the workplace required careful consideration to create a sense of connection and intimacy for the Sky team of workers. 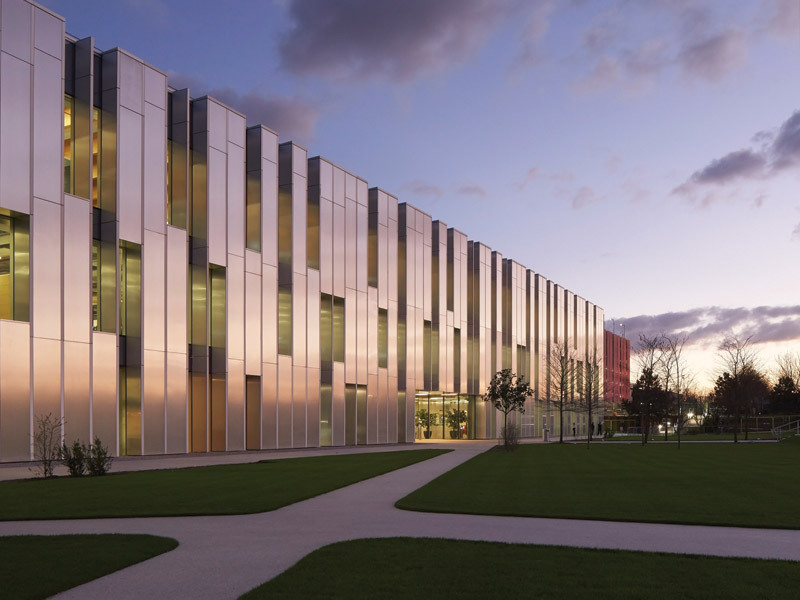 Three levels span the height of a four-storey equivalent building to offer generous height proportions in addition to huge floor plates. HASSELL began by zoning spaces into 18 versatile ‘neighbourhoods’, each housing around 200 people. 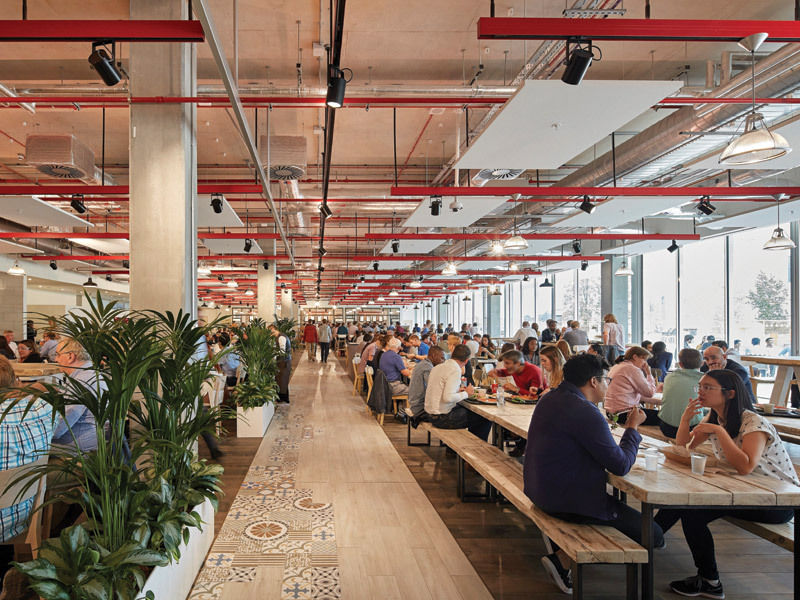 The neighbourhoods include a range of individual and team settings, from interactive to focused, to suit every type of work activity. These neighbourhoods then feature further divided ‘home zones’, to include small kitchens, meeting tables, and casual seating areas. 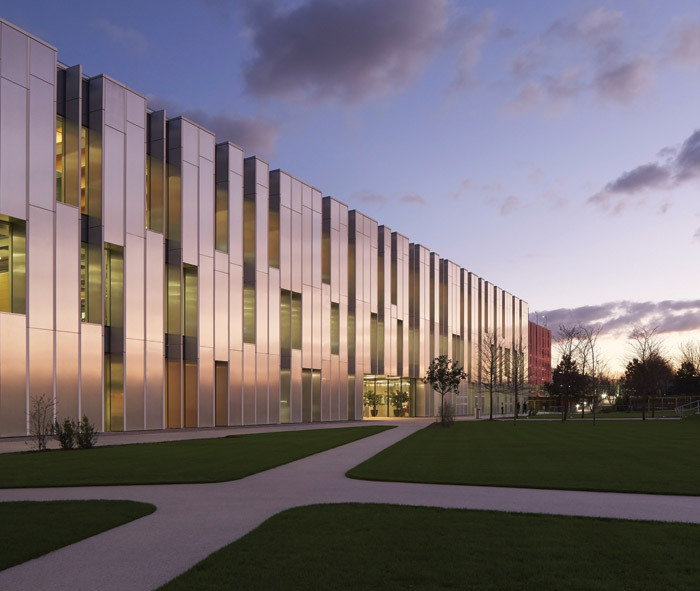 The home zones are one of many key landmarks designed by HASSELL to further break down the expansive floor plates. 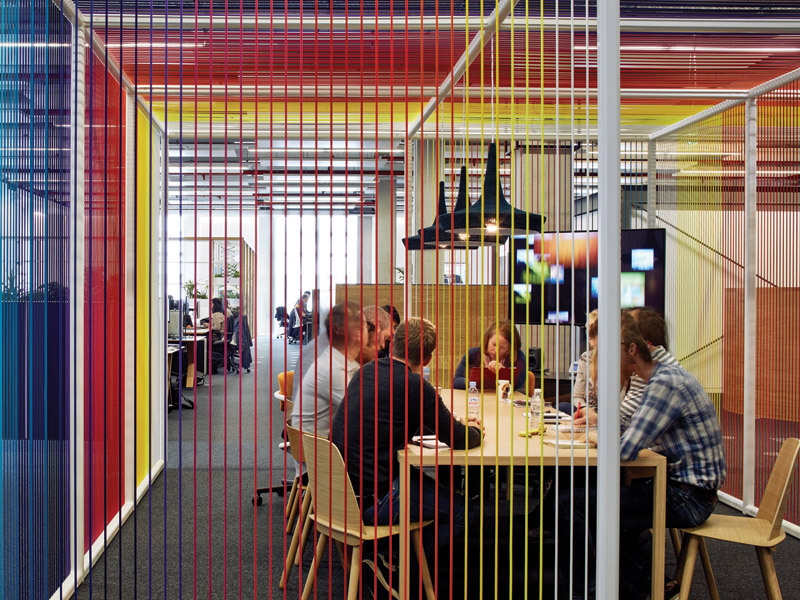 And while refraining from simply shutting off areas, HASSELL uses bespoke metal framing that feature brightly coloured rope screens to ‘form intuitive wayfinding and circulation into different neighbourhoods’, says Roocke. 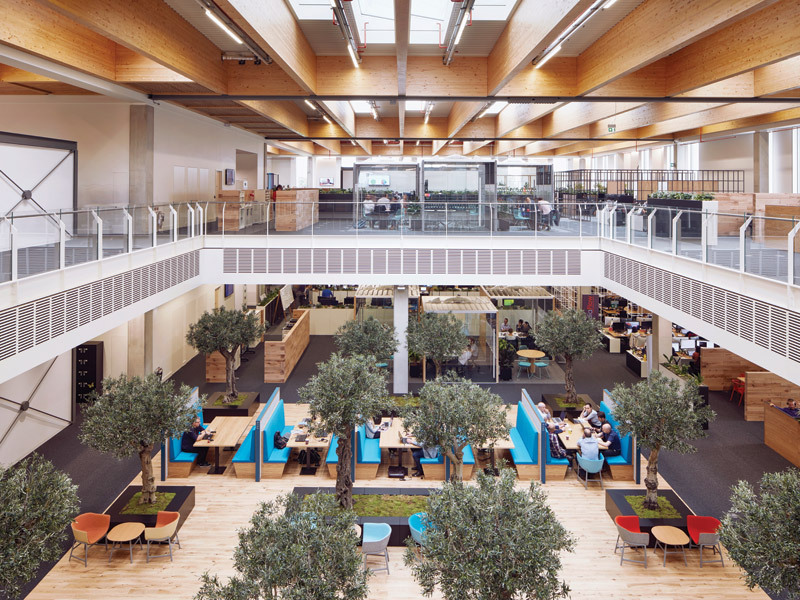 Trees and plants are also placed at 20m intervals to create points of interest as you move through the space, which, in turn, helps form quiet spaces for individual working, without breaking the sense of connection to the more vibrant, active spaces. With the whole scheme designed using a ‘clean and clear’ palette, each level has its own identity. Level 1, above the ground floor, features fresh white desks teamed with solid oak legs to create a ‘homely’ feel. ‘There’s no chrome anywhere either, which gives a friendly, non-corporate feel,’ adds Roocke. On Level 2, black desks feature in a gallery-inspired space, to offset the spectacular glulam (glued laminated timber) ceiling. 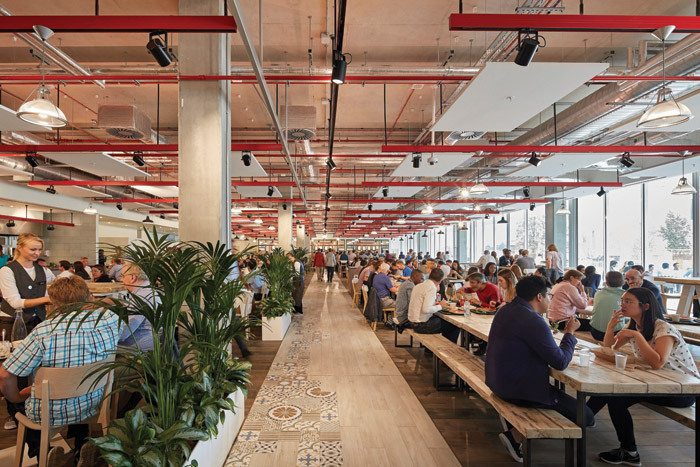 Meanwhile, on the ground floor, staff and visitors entering the building are greeted by cafés, restaurants and the Sky News team, which is housed in a seemingly floating glass box above. 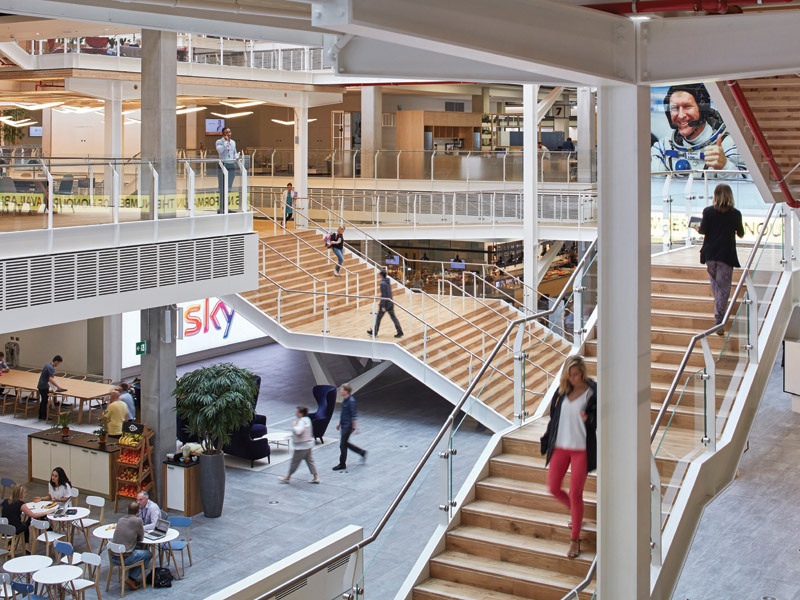 Sky Central also boasts the UK’s first-ever completely cashless supermarket, a choice of six places to eat and drink in addition to a pop-up bar at Sky Cinema – the 200-seat, Dolby Atmos sound auditorium – among other services and conveniences for staff. There was also a plan to include a swimming pool on the ground level, which was built and then covered to accommodate more workstations. ‘It just shows how a brief can change over the two years of a project,’ remarks Roocke. 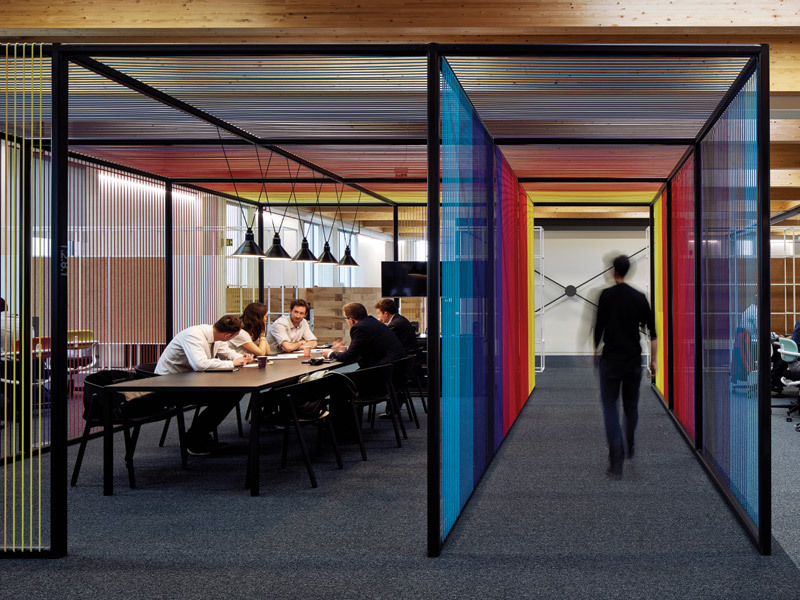 But, as testament to the original brief for a flexible demountable workspace, the design was able to absorb a swimming pool into the workspace, while also having the potential of being used in the future.